Being a bit of a foodie and a builder I thought it would be unforgivable not to build my own pizza oven! 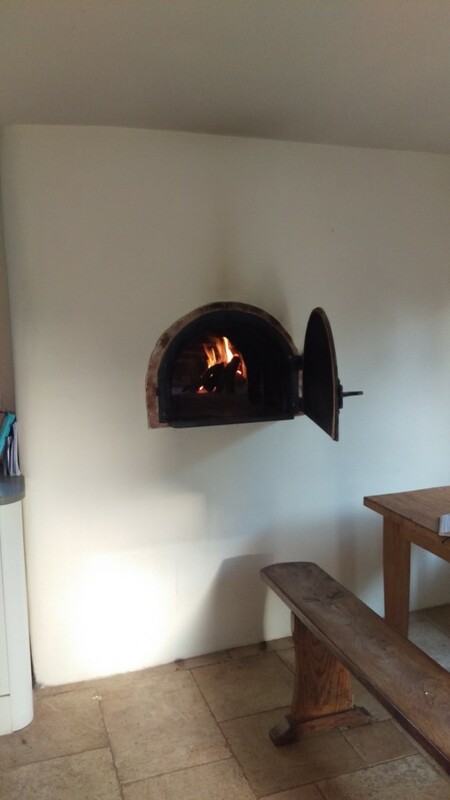 In fact, this is not just a pizza oven – you can cook anything in this beast! You’re probably wondering why I chose not to use cob, what with being a cob builder by trade…There are a couple of reasons. Cob ovens are lovely and often beautiful rustic structures, however, they tend to be temporary. If you’ve ever had the pleasure of hearing me talk about cob you probably know that the worst thing that can happen to cob is for it to get wet. 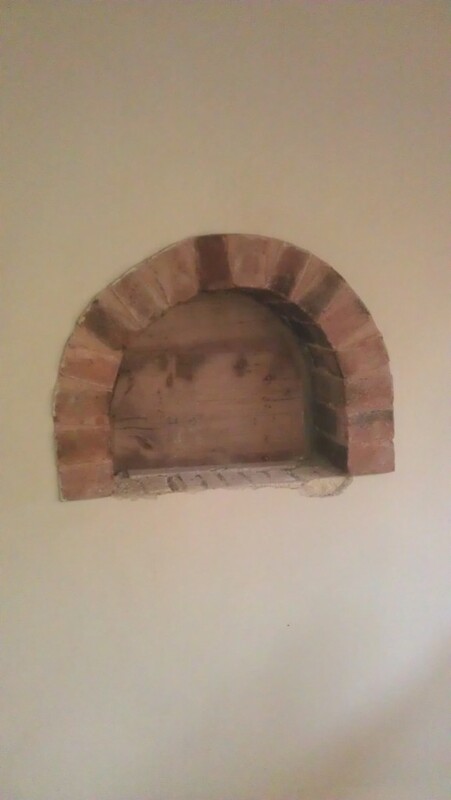 Damp and driving rain can ruin a cob oven. 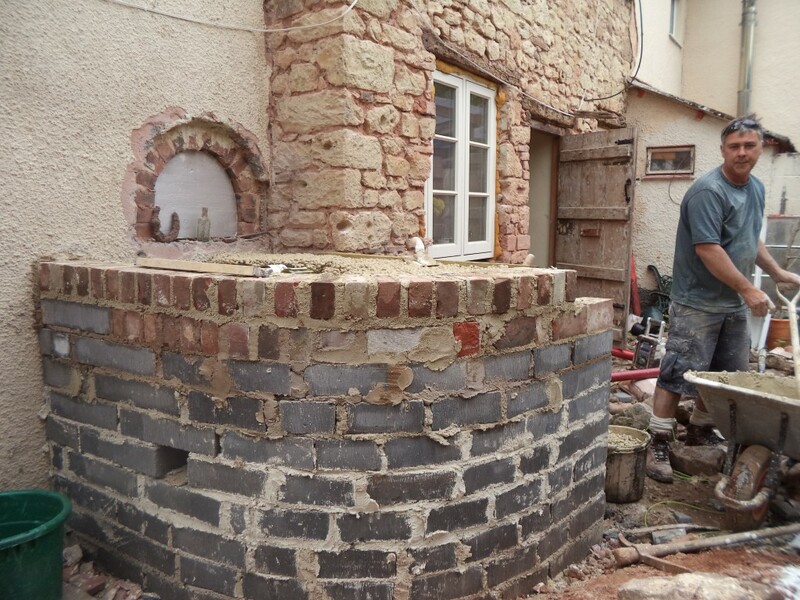 Cob ovens are not difficult to build as long as you have the right base. Once you have established a base you need to have a dry place to keep the oven if you want it to last for a long time. 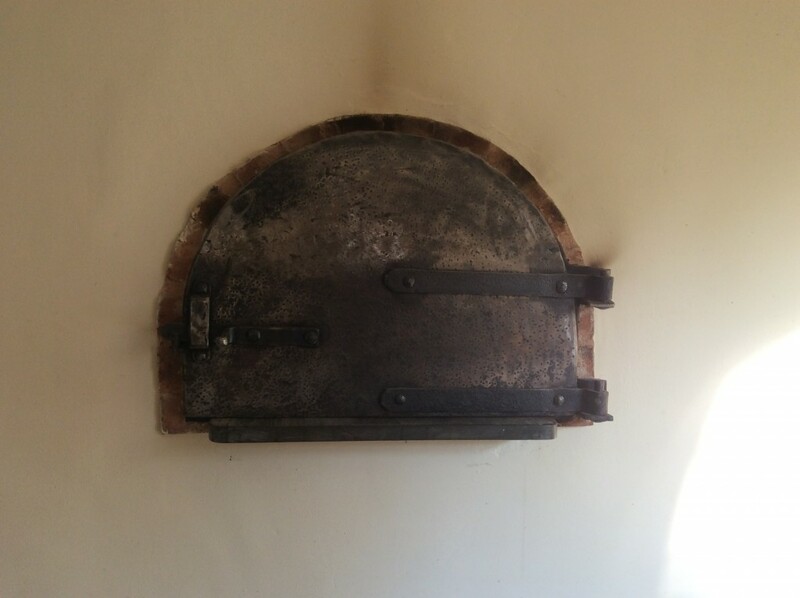 I wanted this oven to be an integral part of the house; here for us, and hopefully those who come after us, to use for as long as the house is standing. And sometimes, just sometimes, I like to do things a bit differently! 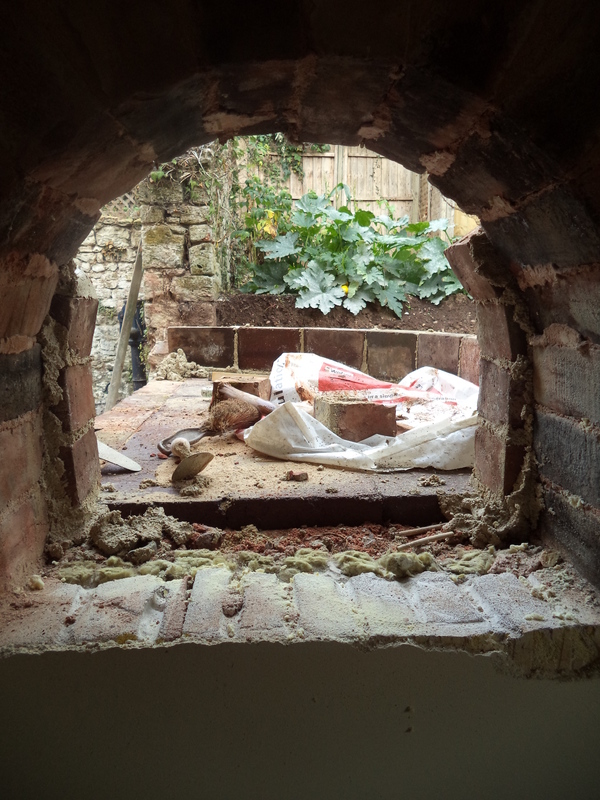 The plinth for the oven is built from light weight celcon blocks and lime mortar. When we pulled out our old night storage heaters we had plenty of bricks so the cooking hearth is laid with these, which allows it to retain the heat. Another material we had a-plenty was wine bottles…Its true! We laid the wine bottles under the base of the hearth with a leca limecrete insulative layer; the trapped air within the bottles keeps the oven hotter for longer. 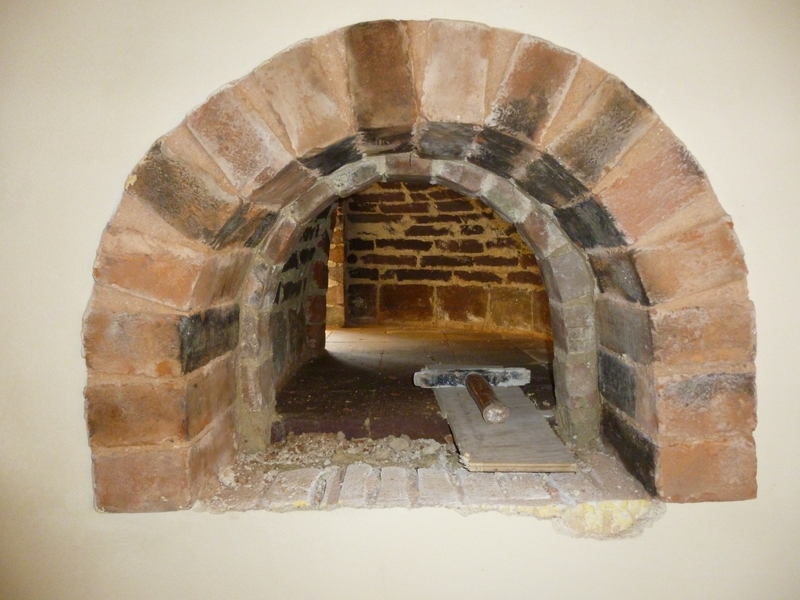 The cavity below the oven is our wood storage area – handy! Rather than just have the oven tucked away in the back yard out of site I wanted it to be incorporated into the house, but more than that I wanted it to be accessible from inside allowing for all year round cooking. After a few weeks of having a rather draughty hole in the dining room all, we progressed. Going to work and building all day then coming home and doing more building was taking its toll…at the time we had just had our second son and my girlfriend was making disgruntled remarks about my paying more attention to the oven than the new baby, so it perhaps didn’t progress as quickly as I would have liked!! Next came the building of the internal cavity, this curves from the internal door in the dining room out through the hearth and opens into the back yard on the other side. We recycled a few more storage heater bricks and I managed to get a bit of lime mortar in there too! 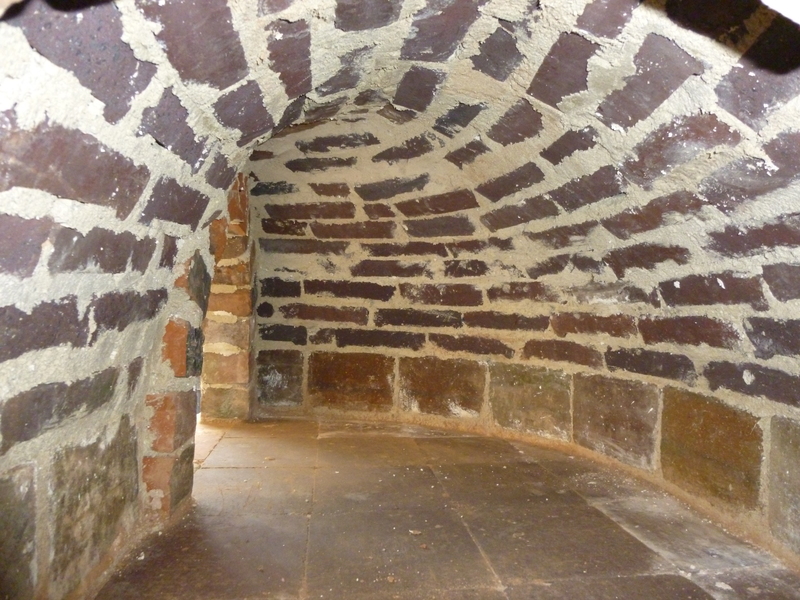 The oven looks quite big from the outside, but it is mainly due to very thick walls built in a curved shape. It contains insulating layers between the internal fire bricks and the external brick outer layer. The inspiration came from a fantastic trip to Puglia in southern Italy where the countryside is prolific with ‘trulli’, most of which contain built in ovens. In order to stop us from being smoked out completely (and having seen a rather fancy chimney flue at Fagins Antiques) I had to install a proper chimney. I want to use the oven all year round therefore it is beneficial to keep it dry. I erected a small lean to roof against the house; this stops the oven from getting wet and producing steam, rather than dry heat. At the external opening we have used a stone curb, again found in the depths of Fagins. We like to use materials sourced locally after all! The ‘floor’ of the oven is made of storage heater bricks. You need a nice smooth surface for the base of your pizza to cook on, otherwise it will stick. We tried a number of beautifully crafted wooden internal doors; unfortunately we were so efficient in creating a nice hot oven that they all caught on fire. Callum Vellacott, a local carpenter, made us a fabulous wooden door, which I backed with thick layers of fire proof board – it didn’t work. The first door was a gift (well, repaid in pizza! ), but after about the third he started charging! Despite how aesthetically pleasing the timber doors looked, we had to give up on this idea. We now have an iron door – it’s rather Lord of the Rings, but it keeps the smoke out. This was built by another contact – luckily we haven’t quite got it hot enough to melt! 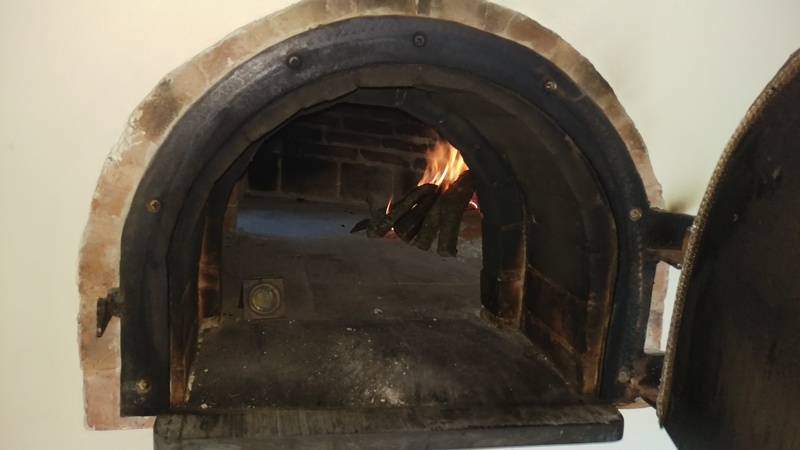 In order to cook in this particular oven we build a fire inside with wood, the cooking takes place in the same area as the fire. Woodsmoke really makes a difference to the taste of your food and certainly enhances the flavours of the food. Once the oven is hot enough, sweep the fire back so it is all contained in one area – be careful not to brush the ash too close into the fire otherwise you may find your broom catches on fire…this has never happened to us, honest! With pizza, we liberally coat the bottom of the pizza dough with dried polenta, this stops it sticking to the hearth. You can then pop the pizza onto a pizza paddle and just slide it in – this takes some practise, I have dropped a few I have to admit! You can buy pizza paddles inexpensively at Pizza Equipment Ltd, this is where we got ours, they have a few different styles you can choose from. If you are cooking in a pot or on a baking tray you can just slide these in. Roast meats will need wrapping in foil in order not to char the outside too much. The best crackling I have ever tasted came out of my pizza oven, so a bit of charring is delicious in some cases! Following our pleasant, mainly dry, summer months of much pizza eating, I am now looking forward to Sunday lunches and a Christmas feast being cooked in our oven. I am hoping to get involved in a community project to build a cob oven next year – more updates on that at a later date! We will also be updating you with deliciously tasty pizza photos, the problem is we’re normally too busy burning our mouths on them in our haste to chow down that we forget to photograph them – sorry! 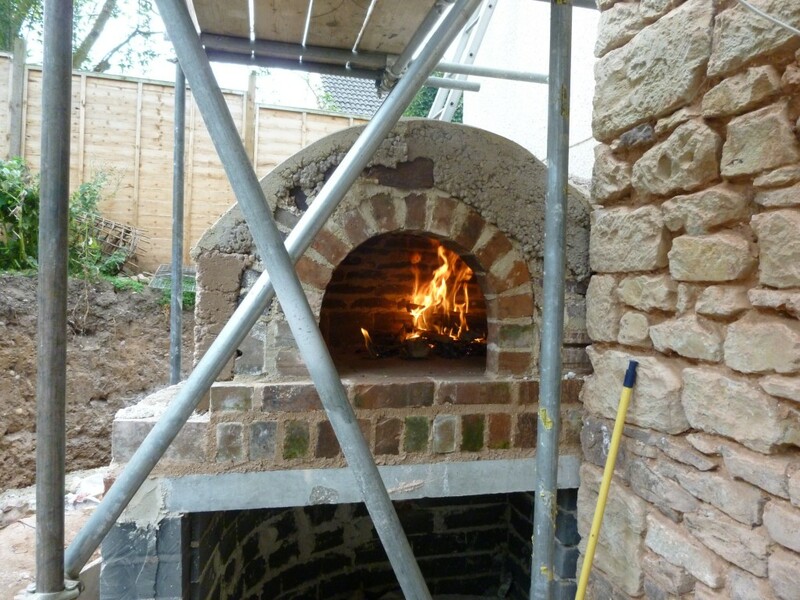 Please do let us know what you think and tell us about your own experiences of pizza oven building!